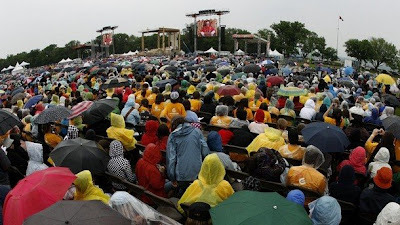 Before a massive crowd estimated at close to 60,000 on Quebec City's historic Plains of Abraham, the 49th International Eucharistic Congress closed this morning with the traditional Statio Orbis, the Station Mass of the Universal Church. Celebrated by the papal legate Cardinal Josef Tomko, the weeklong gathering -- termed a "turning point" for the Quebec church on Saturday by its host, the Canadian primate Cardinal Marc Ouellet -- closed with a cameo from Pope Benedict, who appeared live via satellite to give the homily and announce that the 50th IEC in 2012 would be held in Dublin. "'The Mystery of Faith': this we proclaim at every Mass. I would like everyone to make a commitment to study this great mystery, especially by revisiting and exploring, individually and in groups, the Council's text on the liturgy, Sacrosanctum Concilium, so as to bear witness courageously to the mystery." The Pontiff affirmed that such study would help each person "arrive at a better grasp of the meaning of every aspect of the Eucharist, understanding its depth and living it with greater intensity." "Every sentence, every gesture has its own meaning and conceals a mystery," Benedict XVI continued. "I sincerely hope that this Congress will serve as an appeal to all the faithful to make a similar commitment to a renewal of Eucharistic catechesis, so that they themselves will gain a genuine Eucharistic awareness and will in turn teach children and young people to recognize the central mystery of faith and build their lives around it. "I urge priests especially to give due honor to the Eucharistic rite, and I ask all the faithful to respect the role of each individual, both priest and lay, in the Eucharistic action. The liturgy does not belong to us: It is the Church's treasure." The Pope noted the unifying effects of the Eucharist, both for the faithful with the Trinity and within the Church. "Reception of the Eucharist, adoration of the Blessed Sacrament -- by this we mean deepening our communion, preparing for it and prolonging it -- is also about allowing ourselves to enter into communion with Christ, and through him with the whole of the Trinity, so as to become what we receive and to live in communion with the Church," the Holy Father said. And he added: "We must never forget that the Church is built around Christ and that, as Sts. Augustine, Thomas Aquinas and Albert the Great have all said, following St. Paul, the Eucharist is the sacrament of the Church's unity, because we all form one single body of which the Lord is the head. "We must go back again and again to the Last Supper on Holy Thursday, where we were given a pledge of the mystery of our redemption on the cross. The Last Supper is the locus of the nascent Church, the womb containing the Church of every age. In the Eucharist, Christ's sacrifice is constantly renewed, Pentecost is constantly renewed."